Joining NeNe the cast and Andy Cohen for this part is NeNe’s husband Gregg Leakes. Friends of the Housewives Tanya Sam and Marlo Hampton try to get a peach next season show up to share their opinions. In other news, Kandi Burruss and Porsha Williams discuss the possibly shady timeline of Porsha and Dennis McKinley’s relationship. What’s the point of doing that now? Porsha and Dennis are engaged and just had a baby? Why backtrack on this? Next beef, please. 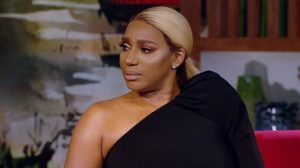 RELATED: Real Housewives Of Atlanta Reunion Part 1 Recap: FRIEND? The ladies discuss the drama from the Tokyo and Destin trips. Hopefully, they do not spend too much time discussing bargain sunglasses and overpriced flip flops. Watch the Real Housewives of Atlanta reunion show tonight at 8 PM on Bravo. Comment throughout the episode on this post. Tweet us with your thoughts. Follow us on Instagram. Like our page on Facebook. Check our site tomorrow for our Real Housewives of Atlanta recap. TELL US- ARE YOU EXCITED TO SEE GREGG LEAKES, TANYA SAM, & MARLO HAMPTON ON PART 2 OF THE REAL HOUSEWIVES OF ATLANTA REUNION? WHAT DO YOU THINK ABOUT THE REUNION SO FAR? SHOULD OTHER REAL HOUSEWIVES OF ATLANTA BOYFRIENDS AND HUSBANDS APPEAR ON THE REUNION SHOW?